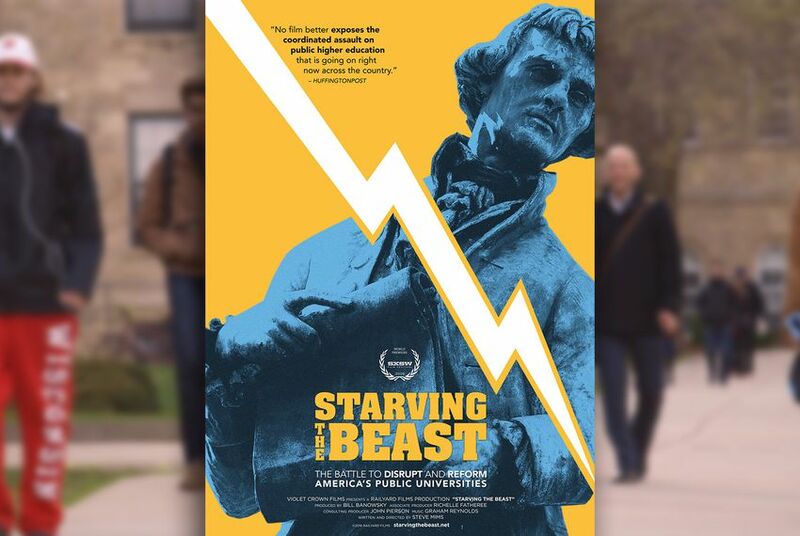 A new documentary titled "Starving the Beast" claims Texas officials have maneuvered higher education into a business rather than a public good. Are public universities nationwide regarded as a public good, or have politicians maneuvered them into becoming business-oriented models where students are the consumers? That's the central question of "Starving the Beast," a documentary by Austin-based filmmaker Steve Mims that premiered Tuesday night at Austin's Violet Crown Cinema. The film looks into how Texas officials perceive higher education as a commodity, linking the decrease in state funding — and coinciding increase in tuition and fees — to massive reductions in government spending, an idea introduced by think tanks that have pushed for education reform in Texas and four other states. In February, all seven schools of the University of Texas System won approval by the Board of Regents to raise tuition $304 per semester by fall 2017. In 2015, the Texas A&M University System announced it would bump tuition by an additional 2.2 percent for all its university campuses, beginning with the 2016-17 school term. The documentary suggests the burden of budget shortfall has shifted to students through public reform as government works to expand the private sector. It claims that conservative groups such as the Texas Public Policy Foundation have sought to scale back funding for teachers and college programs. The film argues that conservative think tanks want students in a free market to bear the costs of their own education, disregarding higher education as a public good. "One of the most controversial elements of reform is looking at whether a professor of a university is a money maker or a money loser," Mims said. "Are we spending money teaching frivolous things, and are people getting degrees where they’re not going to be able to get a job? People try to address it by reforming it." The "seven breakthrough solutions," a set of changes for Texas public universities proposed by former UT-Austin McCombs School of Business teacher Jeff Sandefer and supported by former Gov. Rick Perry and the TPPF, called for the splitting of research and teacher budgets in 2011. Former UT president Bill Powers did not support the reforms, arguing on the film he did not want to "get involved in a street fight." As a result of Powers' rejection of the reforms, the film narrates how University of Texas System Regent Wallace Hall, a Perry appointee, requested 800,000 documents from the university in an attempt to oust Powers for his political influence on the admissions process. "Hall requested thousands of documents, which he examined, to find evidence," Mims said. "Many believe his ultimate aim was to have Powers replaced by an appointee more favorable to Gov. Rick Perry’s higher education reform program. Hall himself predicted Powers' departure early in the process of collecting the information he wanted for his investigations." Mims said the name of the film, "Starving the Beast," refers to the way in which free-market supporting politicians starve the government by reducing government spending as they reduce taxes. Powers, who attended the premiere, said students' futures are in play as tuition in public universities increases without glimpses of proper funding. The film links Texas schools' current funding woes to a trend among flagship state universities across the nation, such as in Louisiana, North Carolina, Wisconsin and Virginia, where universities suffer defunding as a result of tax cuts. "I think it's an ongoing concern," Powers said. "We want public research to be efficient. There are concerns that every university president is worried about. Higher education does require funding. The beast is indeed being starved." UT-Austin President Gregory Fenves announced $15 million in aid for middle-class students starting in 2017. Prairie View's football team lost 67-0 to Texas A&M but received $450,000 just for playing. Disclosure: Steve Mims, The University of Texas at Austin, Texas A&M University and the Texas Public Policy Foundation have been financial supporters of The Texas Tribune. A complete list of Tribune donors and sponsors can be viewed here.